U.S. and Somali military officials said Saturday that scores of al-Qaida-affiliated fighters had been killed during an attack on a government military base near Somalia's southern port city of Kismayo. The militants launched a surprise dawn attack Saturday at the base near Bula Gudud village, 50 kilometers north of Kismayo, starting with triple suicide blasts. Scores of heavily armed militants then stormed the base from all directions, Somali officials told VOA. "The terrorists have attacked the base with suicide blasts, and fierce fighting occurred. 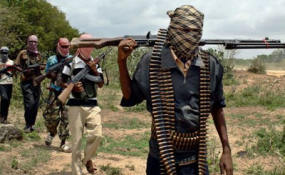 We defeated them and forced them to flee, killing at least 70 militants during the attack and an airstrike that followed," Abdinur Ibrahim, regional security spokesman, told VOA. U.S. officials said Saturday that 52 al-Shabab militants had been killed in the retaliatory airstrike following the initial attack. The airstrike targeted a site in Somalia's Middle Juba region and no civilians were killed or injured, according to a U.S. Africa Command press release. The armed group claimed responsibility for the military base attack and said 41 Somali soldiers had been killed in the incident. "Our fighters started the attack by detonating a huge car bomb inside the base and then the suicide infantry followed to eliminate the soldiers who survived from the blast. Forty-one soldiers from the apostate government were killed," a pro-al-Shabab website claimed. Medical sources at the Kismayo hospital said the bodies of eight Somali soldiers and 19 others who were injured were brought to the hospital. Multiple military sources familiar with the attack told VOA militants outnumbered government soldiers in the base and briefly took it over, seizing some weapons and military supplies before military reinforcements countered the offensive. About an hour after the militants left the base, an airstrike carried out by unidentified foreign forces supporting the Somali military killed more than 60 militants. At least two missiles hit the militants driving away in a military truck and two Toyota pickup truck they seized from the base, officials said. "On their way back, after the defeat in the battle for the military base, an airstrike hit the militants, killing all those in three vehicles, estimated to have been more than 60," a Somali military official familiar with the airstrike told VOA on the condition of anonymity. Both the militants' claim and that of the Somali military could not be independently verified due to the remoteness of the area. But to support their claim, the Jubbaland regional administration released graphic photos showing completely burned military transport vehicles and body parts that were strewn on and around them. The U.S. military recently increased its periodic airstrikes in Somalia to help the U.N.-backed government in its fight against al-Shabab and Islamic State. Last June, a U.S. soldier was killed and four other soldiers were wounded in a firefight against al-Shabab militants near the same base attacked Saturday by the militants. Alexander Conrad, 26, of Chandler, Ariz., and his wounded fellow soldiers were fighting alongside about 800 troops from the Somali National Security Forces and Kenyan Defense Forces when they were hit with mortars and small-arms fire. Saturday's militant attack came days after al-Shabab struck a Nairobi hotel and killed at least 21 people, including an American citizen. Kenya has military personnel in the southern part of Somalia where they are fighting terrorists under the African Union's mission. Khadar Hared contributed to this report from Nairobi.